A total of 22 diamonds encrust this lovely pendant, giving off a big dose of sparkle in a small space. This glimmering outline of a heart is completely covered in stones, making it a lovely way to celebrate a love that makes your heart glow. The bale that holds this sophisticated heart is also covered in diamonds, while the 14K yellow gold in which these stones are set adds a touch of warmth. An 18-inch coordinating box chain adds a fitting finishing touch. 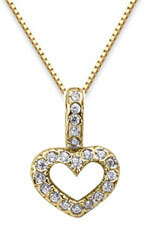 We guarantee our Diamond Heart Drop Pendant, 14K Yellow Gold to be high quality, authentic jewelry, as described above.